From a stunningly beautiful region of County Mayo, Ger Chambers grew up steeped in Irish traditional music. Learning in a totally organic and informal way from his father, while surrounded by remarkable natural beauty, Ger’s music is characterized by instinctively impeccable phrasing, rhythm you could set a clock by, and a dynamic palette as undulating as the skyline of his home. As he grew older, Ger’s influences expanded to include Dermot Byrne, Jackie Daly, David Munnelly and Máirtín O’Connor, leading to his unique brand of vibrant yet soulful playing. 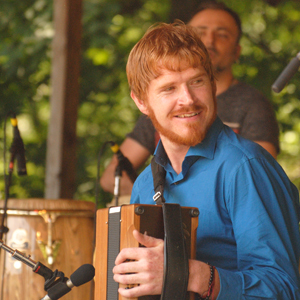 The Connacht champion in the Scór competition on accordion, and also a prizewinner in the Grúpa Ceoil category, Ger is currently a member of Galway-based band Immis who have played various festivals including Body and Soul, Celtic Shore Festival, the Electric Picnic, and the Volvo Ocean Race. A staunch advocate for the promotion of Irish traditional music, Ger established Athlone I.T.’s first ever Traditional Music Society, organizing ensembles, sessions and concerts throughout the town. He is much in demand as a session player and enjoys soaking up the rich music culture of Galway City.